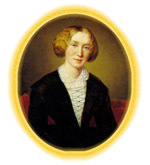 Dorothy Edmands had been a member of the George Eliot Fellowship for well over 30 years and during that time had been a most supportive member... She served on the Fellowship Council for very many of those years and, although a quiet and very modest lady, had been extremely generous. Whenever money was needed for whatever project, Dorothy was there with her ever open purse. Dorothy trained to be a teacher at Furzedown College in London and began her teaching career at Stratford upon Avon. A few years later she moved to George Street School in Bedworth, her home town, and her teaching days are remembered with gratitude and affection by generations of Bedworth children and their parents.